Rizk is a new instant play and mobile casino brought to you by the people behind Guts gambling powerhouse. That’s exactly the type of new sites we are waiting for: fresh and exciting and yet backed up by a strong and experienced company, with clean history in terms of fairness and professionalism. Risk Casino offers a huge number of online slots, including all titles by NetEnt, Microgaming, IGT, Play’n Go, BetSoft, NextGen and more. These day you can enjoy their special “launch” welcome bonus of 200% up to $/€ 150. Restricted Countries: USA, UK, Belgium, Denmark, France, Germany, Italy, Spain. Here you can find our top lists for USA friendly casinos , UK casinos and European casinos. 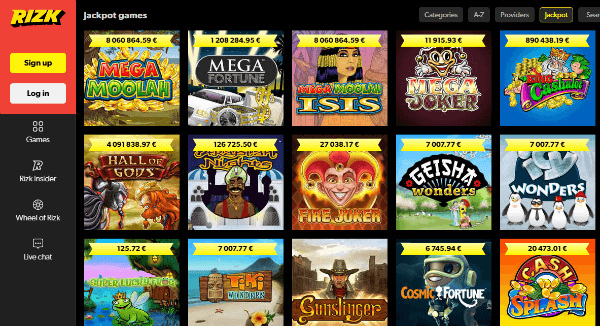 We won’t continue listing additional software providers Rizk casino offers, but just list Top 8 loosest slots. (We do that only for those that publish official RTP). We start with 1429 Uncharted Seas which offers superb 98.6% return. Blood Suckers and Break Da Bank Again are set on 98% return. No wonder these are so popular. (The bad part is that bets on 1429 Uncharted Seas and Blood Suckers will count only 75% towards completing bonus wagering requirements). Next in line are Good Girl Bad Girl and Kings of Chicago with 97.8%. Devil’s Delight, Hot Ink and the unique Esqueleto Explosivo close our Top 8 list. Other games include Video Poker, Blackjack, Roulette, Craps, Live Dealer tables and the progressive Mega Moolah and Mega Fortune which are worth millions of dollars. New players can take advantage of Rizk casino bonus of 200% up to $/€ 100. The minimum deposit to get the bonus is $/€ 10. In terms of wagering requirements – the bonus must be wagered 45 times, which is a bit high. (In their sister Guts casino the WR is only 35 times). Please notice that besides Bloodsuckers, 1429 Uncharted Seas and Jackpot Jester 6000, Jackpot Jester Wild Nudge will count only 75% towards the WR. The variety of payment methods Rizk offers is a bit limited, but you will be compensated by speed and convenience. You can deposit and withdraw funds through MasterCard, Visa, Neteller, Skrill, Paysafe Card, Bank Wire and Trustly. Most of these methods can be used for withdrawals as well. Withdrawals with ewallets are instant, which is great. Credit cards and bank wire will take 1 to 3 days. The minimum deposit is $/€ 10 and it goes up to $/€ 5,000. The withdrawal limits are $/€ 20 to $/€ 5,000. Edgy new only casino powered by a strong and reputable company. Extraordinary variety of slot machines and other games. Instant withdrawals. The drawbacks are higher than average wagering requirements and the fact that US and UK players are not accepted.